Few passages of Dante’s Commedia have been as widely studied and debated as the opening lines of Paradiso XXV, in which the Florentine poet dreams that his great text might be his passport back to the city which had exiled him. In these lines is contained, in nuce, the whole project of the Commedia: its focus on the heavenly while engaging with the earthly, its conversionary intent, the great claims made for it by its author as a poem like no other, and its embracing of the theological, the political, the poetic and the personal in an inextricable unity. 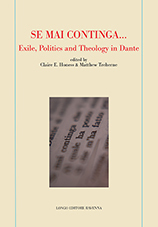 These elements – theology, politics, poetry – represent also the subject-matter of this book, which takes Paradiso XXV as its inspiration and starting-point, but which ranges across the whole of Dante’s oeuvre and beyond, to explore the far-reaching lessons and ideas which these lines evoke.